Plymouth at one time had a Promenade Pier. This ran into Plymouth Sound from a point below what is now the Belvedere. It was destroyed during the Second World War and has never been replaced although older residents, who remember it with affection, are always suggesting that it should be. The Promenade Pier had been the idea of Mr Edward S Lancaster, of Old Town Street, Plymouth. It was authoriised by the Plymouth Pier Order made as part of the Pier and Harbours Confirmation (No. 1) Act 1878. Work started during the first week of January 1880, when 'several poles surmounted by little red flags' appeared in the ground beneath the Camera Obscura to mark the boundaries of the rock and shore to be covered by the construction. Workmen's sheds were erected in the Bull Ring. Formal approval of the plan had still not been given by the Council but it was decided not to treat the Company or its workmen as trespassers on the assumption that approval would be given in due course. In August 1880 the Marine Piers Company invited the public to subscribe to shares and it was announced that the Pier would be 610 feet in length by 60 feet wide with a pier-head of 210 in width. A pavilion capable of holding 2,500 people was to be erected at the pier-head. However, that plan was quickly abandoned when the people of Plymouth realised that a pavilion would shut out their view of Drake's Island and objected most strongly. It was designed by Mr E Birch, of London. The original contractor was Messrs Laidlaw Sons & Caine of Glasgow. It was hoped to have the Pier open for the summer of 1881 but, as the Western Daily Mercury reported at the end of 1880: 'However heartily the company may have desired this, we don't think their wish will be fulfilled.' At that time ten iron columns had been placed in position and a solid wall of masonry had been erected just inside the road. Between the wall and the road seven tiny houses were being built for the reception of lumber. Only twenty men were employed on site at the start of 1881. Following some financial problems the contractor was changed in November 1882 to Mr C E Daniel of London, who just happened to be a member of the Royal Western Yacht Club. At the time he took over, only the supporting iron-work and girders of the first section of the Pier had been constructed. Mr Daniel immediately engaged a large band of local carpenters who, under the watchful eye of the resident engineer, Mr Dawson, set about laying the pitch pine flooring. The cost of the project was about £45,000, all of which was raised outside of Plymouth by Baron Albert Grant. Great emphasis was made of the point that the people of Plymouth were not asked to contribute a penny towards the cost. Some £17,000 of the cost was spent locally on labour and materials. One hundred and forty columns embedded in solid rock supported the 420 feet long structure. The sloping entrance of 130 feet in width contracted to just 60 feet at the start of the "banjo" part and the whole was some 20 feet above high water level. The decking was 2½ inch pitch pine. The "banjo" area included a reading room, a stationery and bookstall operated by Mr W H Luke, slot machines, and even a post office. On the seaward side were the refreshment rooms of Mr H Matthews. Two iron staircases led down 20 feet to the sea to facilitate the embarkation of the pleasure steamers at all states of the tide. There would be a depth of at least 26 feet of water at mean tide. At the entrance to the Pier, the extent of the Company's property was to be marked by two granite pedestals 'of gigantic proportions', each surmounted by a 30 foot flagstaff. The main central gates were cast by the original contractors, Messrs Laidlaw, Sons and Caine, each displaying the Plymouth coat-of-arms. A Mr Drake was the Clerk of Works, a Mr Dring was the electrical engineer, Mr S Roach was the mason, and Mr Roberts of Stonehouse was responsible for the painting work. The screens were supplied by Messrs Lascelles and Company. Mr J Rendle was appointed the Manager. The telephone number was Plymouth 166. The Pier was officially opened on Thursday May 29th 1884, when the guests gathered at the Council House for light refreshments before processing to the Pier, where they were welcomed by Baron Grant, chairman of the directors, Mr C E Daniel, the contractor, and Mr E Lancaster. The Band of the Royal Marines was, as ever, in attendance. Then the Mayor, Mr John Greenway, was presented with a silver guilt key made by Messrs Elkington & Company of London, and he proceeded to unlock the gate. Some 30,000 people attended the ceremony and it was estimated that 10,000 were on the pier itself. After many speeches extolling the virtues of the project (as one would expect from the Victorians), it was reported that 'Nellie, the Plymouth flower girl, was as enterprising as usual having brought some handsome bouquets and button-holes'. All this was held in the open as the Concert Pavilion seating 2,000 was not built until 1891. Unbelievably, the Promenade Pier was purchased by a fish merchant in 1887. On Thursday September 22nd of that year the Pier was offered for sale by auction at The Mart, Tokenhouse Yard, London East Central. The sale had been ordered by Mr Justice North of the High Court of Chancery. It was at this time in the occupation of one Mr Thomas Stephen Martin under a three-year agreement made on March 25th 1886 (Lady Day). He was to pay a rent of £800 for the first year, £900 for the second year, and £1,000 for the third year, with a right to renew the agreement for five years. By an agreement dated July 20th 1882 an annual acknowledgement of £1 1s was paid to Plymouth Corporation for the easement of erecting and maintaining the Pier. After a false start, the bidding opened at £5,000 and increased quickly to £7,500. During the lull the auctioneer, Sir John Whitaker Ellis MP, of the firm of Messrs Farebrother, Ellis, Clark & Company, predicted that Plymouth Corporation would soon wake up to the value of the Pier and suggested it could then be sold on at a profit. This brought some more bids until £11,000 was reached. Sir John then offered to take bids in stages of £100 (the previous ones had been in £500 jumps) and bidding eventually reached £12,000. It was knocked down at that sum to Mr Walter Henry Kay, the said fish merchant, of 1 Citadel Terrace, Plymouth. About forty people were present at the sale, although bidding was confined to less than six of them. Mr T S Martin and Mr W R Gilbert, of Saltash, were among those present. But even then the Pier still had problems and it was with great relief that on Saturday March 24th 1888 the western Morning News reported that: 'After undergoing several vicissitudes of management during the past four years - the first four of its existence - Plymouth Promenade Pier is not to make an entirely new start. With new owners and new management the clock, which now again surmounts the entrance, has a fair chance of going on telling the time without any more of the unseemly interruptions which have hitherto beset its course.' It was not stated who the new owners were but the courteous, careful and energetic Mr James McBryde was put in charge as manager. Firstly, the Pier received 'what it never had before - a thorough good coat of paint.' The vanes were re-tipped with gilt, and Messrs Randle and Prowse painted or varnished everything in sight. The refreshment rooms had been let to Messrs Matthews & Sons and the two kiosks at the entrance were let to Messrs James Denham & Cuthbert Collingwood, tobacconists, and Miss Georgina Emily Tierney, fancy goods. The United Telephone Company also provided a call-office at the entrance. Messrs Willoughby Brothers thoroughly overhauled the iron staging beneath the Pier and Mr Scawn put all the electrical work in order. Every alternate lamppost now boasted a lifebuoy for use in an emergency the news that river excursions were once again to be provided by Messrs Rowe's was warmly welcomed. Admission was to be the 'popular penny' and books of tickets at a reduced rate would also be available. Cheap bathing tickets would be available until 8.30am. In fact it later transpired that the new owner was a 'plucky' gentleman by the name of Mr Kay. He intended to vest the ownership in a limited liability company, to protect his financial interests, and some 8,000 shares had already been taken by October 1889. His judgement in appointing Mr James McBryde as the 'spirited and successful' manager turned out to be well rewarded, for the net earnings reported for the year ended June 30th 1889 were £1,800. It was Mr Kay who was responsible for the erection of the pavilion in the centre of the Pier. It was designed by Mr Walter Lethbridge and was expected to cost £5,000. The Pier became the headquarters of the Plymouth Ladies' Swimming Club and the Seven O'clock Regulars, who usually gave swimming and diving demonstrations during the Port of Plymouth Regatta Week in July each year. The Minima Yacht Club had its headquarters in the buildings at the entrance. During the winter months the Pavilion was used to host concerts but in the summer it was turned over to roller skating, boxing, wrestling and dancing during the week and military band concerts on Sunday evenings. In April 1932 the Pavilion was used to house a motor show at which the new Ford 8 horse-power car was displayed. In 1910 the pier company expanded their range of interests by acquiring a local steamer company that operated the North Corner to Saltash Ferry and thus took on the snappy title of The Plymouth Piers, Pavilion, and Saltash, Three Towns Steamship Company Ltd. Unfortunately the fascination with piers was beginning to wane and in 1922 the company disposed of some of its steamers. In 1934 the directors reported a loss of £1,276. The 1935 accounts showed a slightly happier picture with the pier valued at £69,000 and some £500 in the bank. An effort to sell the Pier, along with the one at West Hoe, to the City Council failed and in 1938 a Receiver was appointed. The problem of what to do with the Pier was solved three years later when the Germans destroyed it during the Blitz. 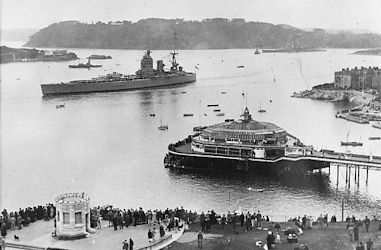 HMS "Rodney" sailing out to sea past the Plymouth Promenade Pier. Date unknown but clearly pre-1941, when the Pier was destroyed. The blitzed remnants remained until at the end of 1952 the City Council announced that they wanted it removed as soon as possible. There was no provision in the "Plan for Plymouth" to rebuild the Pier. The War Damage Commission agreed to meet the cost of £4,754 and so a contract was placed with Messrs Eglinton Brothers of Plymouth for the demolition and removal of the ironwork under the supervision of engineers, Messrs G H Ivory & Partners. Work commenced in April 1953 and was to be completed by September 30th. Divers went down below the water to unbolt as many of the cross-members as they could before cutting off the the ironwork that projected above water level. The Pier was built on iron columns embedded in the rock and these were removed by blasting. The Plymouth Piers, Pavilion, and Saltash, Three Towns Steamship Company was wound up and their other properties, the West Hoe Pier and the Royal South-Western Yacht Club premises (originally the Plymouth Sea Baths), were sold off.